I have always tried to think a bit outside the box. I don’t necessarily mean that as a self-aggrandizing compliment as much as a matter of choice. The fact of the matter is, I get bored rather easily. When I am out on a long solo bike ride, for instance, I keep my mind busy by performing square roots in my head. Yes, I could see how you might think that square root calculations are the epitome of boredom, but trust me, it is far more exciting than riding for three hours without an interlocutor. Then there was the time in graduate school at Penn where I was charged with writing an ethnography. We needed to visit the same site for a predetermined minimum number of times and then write about the experience. All of the other students in the class opted to observe a classroom at some level or another, which made sense since the course was in the School of Education. Being in classrooms almost all of my life (I was a high school teacher before grad school), I found that rather mundane and typical. Thus, after weighing a few options, I decided to conduct my ethnography in a bar (yes, that even seems like a rather obvious choice to me at this point), as I tried to determine what it took to be considered a “regular.” Thus, every day, after class, I would spend the better part of two hours at my neighborhood bar, drinking Belgian beer, observing, interviewing, and taking notes. My chosen “classroom” (from Yelp). Thus, when presented with the Monthly Wine Writing Contest theme of “pairing” I wanted to do something at least a bit different from what most people think when they hear “wine” and “pairing” together. Many have tried to find the “perfect” wine pairing for just about everything: Thanksgiving, Adele’s new album, Halloween Candy, food (duh), and even your own personal moods (consider that a rant foreshadowing). 1winedude.com: I have known Joe Roberts for a few years now, and I consider him a friend. We have shared a few bottles over the last couple of years and perhaps Joe’s most notable quality is that he is not shy to talk about anything on his mind. He is not afraid to leave anything out there, even if it is cringe-worthy. This is the guy who famously posted his financial records on his website and has more recently let his feelings known about his soon to be ex-wife (in case you missed it, he is not all that fond of her). My Choice: Petite Sirah. Multi-faceted, never shy, at times in your face, ready to challenge your opinion on what wine should be despite its “petite” nature. Fermentation: I first met Tom Wark back in 2010, before I started blogging, and honestly, I did not know then that he was a major force in the wine blogging world. I knew him as the partner (I do not think they were married yet) to one of the nicest people you will ever meet, Kathy Berez (now Kathy Berez Wark), who was the office manager at one of my favorite wineries, Failla. That first encounter was, well, rather interesting. Tom seemed to be always pounding away on his laptop and in a rather grouchy mood. Since that first meeting, I have run into Tom a couple of times at Wine Bloggers Conferences, where his personality seems to emulate his blog (or vice versa, of course): his writing vacillates from jovial, to somewhat cantankerous, and back. He will rail against what he sees as the evils of the wine industry one day, and then post an endearing article about his toddler son Henry the next. My Choice: Pinot Noir. Pinot, more so perhaps than any other grape, can reflect the place where it is grown and has been known to be a rather finicky vine to tame. At times fruity and lush, others austere and tart. Jameson Fink—Wine Without Worry®: I have never met Jameson, but I keep warning him that it will happen sooner rather than later, particularly now since he has moved from Seattle to New York for his new post of Senior Editor at the Wine Enthusiast. It appears (at least for now) that he will be maintaining his blog, which is a very good thing as I enjoy his irreverent, introspective, and entertaining style. A Sicilian wine would be an obvious choice since Jameson recently spent some time there and appears to enjoy the island and its wines, but he would likely chastise me for taking the easy route. No, it needs to be something funky, and a little bit different, much like his approach to wine writing. My Choice: Orange Wine. Orange wine is the term given to white wines that is vinified like a red (the juice remains in contact with the skins during fermentation, which in white wines can impart a bit of an orange hue). Those skins bring tannin into the wine, which is usually absent in whites. Somewhat paradoxically, most whites were made like this for centuries, and it is only recently that “traditional” white wine making has excluded the skins from the process. This entry was posted in #MWWC21, Orange Wine, Petite Sirah, Pinot Noir, Wine. Bookmark the permalink. I am worried that the boredom factor will increase many fold in very flat Houston…. Nice take on it. But where are the ladies? Perhaps I should do the she said version? Alissa, you are correct! I had included a few originally, but it the post was far too long. Maybe I need another post on the issue? I love this! I would never chastise you…online. Saving that for when we meet in person. Ha! I get chastised a lot, so there you are going against the grain again! I am glad you liked the piece–I was a bit hesitant to do it at first, but in the end…What the heck? I would have gone with Nero for 1WD, maybe… you know, keeping the Sicilian connection real and all that. For you, DC… Hermitage, I think. Spicy when it needs to be, smooth when it needs to be, energetic when it needs to be, and can deliver the goods on quality. Joe, good idea. Turnabout is fair play so I need to think of a wine for TDC. Going with the Commanderie de Peyrassol rosé…in a 3L box. In-the-box drinking for out-of-the-box thinking. The “rosé” a nod to his rants (“rose’ ” “rose”). And it can be strapped to a bike rack safer than cases of Champagne. Ha! Yes! More quality wines in boxes for all! Hermitage is a nice call! Although I’ll never be able to afford it, someone should sure be drinking it! 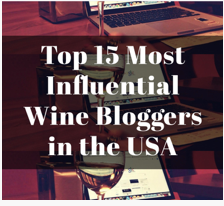 What an awesome read and loved the idea of ‘pairing’ bloggers/friends to wines – brilliant! Salute from Rome! Thanks so much! Cheers from Philly! Yeah, I will revisit this soon in another way…. Wine with pot? I will need to find that post for something else I am pondering! I missed the tasting–how was the wine? I am guessing it was a bit, uh, troublesome? It was a big wine with powerful Paso Robles fruit. I seriously had purple teeth after a single glass.